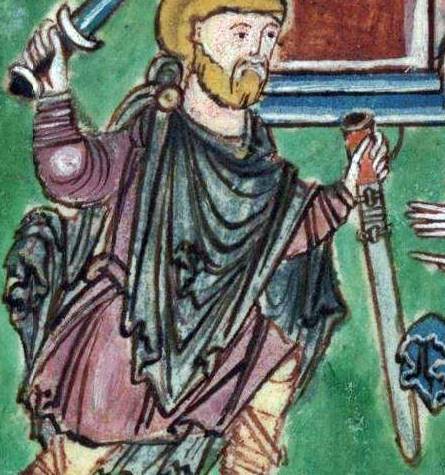 Forum Index > Historical Arms Talk > What did 8-12th century scabbards really look like? Posted: Wed 26 Oct, 2016 4:11 pm Post subject: What did 8-12th century scabbards really look like? The most common covering for scabbards was linen. I think this was not glued on but rather waxed linen sewn onto the wooden core. I dug up a description of the Emperor Charlemagne that mentioned a waxed linen scabbard covering. Many scabbard cores consisted of two halves that were not glued together. The previous point may also explain the 'cross ties' i.e. X and Zig-Zag shaped cords or ribbons/straps that seem to be tied around some scabbards in illustrations. Perhaps they were there to keep the scabbard halves together? Leather was relatively uncommon as a covering and when it was used it there was a layer of (probably) waxed linen underneath. Geibig says leather covering cannot be proven on any surviving German scabbards but there is an example from Iceland that I know of (Sílastaðir 4) and at least one of the scabbards from Cronk Moar that were leather covered on top of a layer of linen. Also some surviving scabbards from Norway are leather covered. Leather covering sometimes took the form of strips of leather wrapped around the scabbard (did not expect that). There were very few metal fittings on these scabbards as a rule, usually none (except maybe for belt buckles and D rings), and when metal fittings were used they were probably usually made of iron. Metal chapes were very uncommon. In Iceland only 5 or 6 have been found for a total of 24 swords and in Norway a similar number for some 2000 swords. Can't speak for the rest of Europe. Scabbard sliders do not seem to have been terribly common during this period, at least not in Iceland/Norway because I'm not aware of any surviving examples. I have heard the argument that hey were probably all made of perishable materials but quite frankly I find that hard to believe. If scabbard sliders were common there should be at least a few surviving examples made of metal or bone. Not sure about scabbard lockets/mouths. Does anybody know how common they were? Also, there is one thing that I've been pondering. 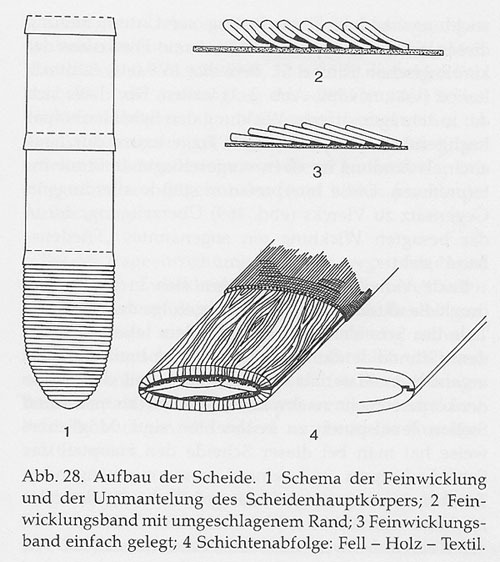 Many of these linen covered scabbards seem to have had a chape that consisted of a tightly wrapped linen spiral as illustrated in the attached scan from Geibig's book and reproduced by Tim. However, the thing I'm still not sure about are the cross-tied, zig-zag and spiral cords/strips wrapped around the scabbards and illustrated in the second scan from Geibig's book (which unfortunately does not show in the post). Tim reconstructed these as being decorative and under the linen wrapping. They may have been under the linen or leather cover but I'm having trouble with these things being decorative. Surely these cross ties would have served some purpose? Were they on top of the covering? Did they hold the halves of the wooden scabbard core together? I can se how No. 10 for example would be the ribbon of the linen chape wrapped as reproduced by Tim in a long spiral around the rest of the scabbard. I tried reconstructing some of these other cross ties with a bit of string and some of them look plausible like No 5,7,9,12 and 13. Other ones like No. 1, 4, 6 and 8 just fall off when I try to reproduce them with a bit of string. Any ideas on what these cross ties would have looked like on an actual scabbard? That's interesting. Do you know if they would have been painted at all or otherwise treated against moisture? Alternatively do you know of any modern stuff that can be used which won't be visible to the naked eye? Excellent post, excellent questions, excellent observations. I agree with your statement that people have a fetish for pimped-out scabbards that are not historically accurate. Not only is this true with Viking scabbards, but medieval scabbards as well. I am very interested in your research on Icelandic finds. I have been looking, but haven't found much at all, except for an ornate chape. Please send me a PM of the literature you have found, I would love to see it. I am working on a 10th C Icelandic sword scabbard myself, just cannot find any references. I find it hard to believe that the Icelandic settlers would completely change the way that they made scabbards, as compared to scabbards in Scandinavia. I am not entirely convinced that finished Icelandic scabbards didn't have an out cover of leather. Sliders were common in Britain during the time period that you mentioned, so why not Iceland? Then again - there is one rock carving dated to the 10th C that shows a scabbard suspended on a belt. So maybe the 10th C was a transition period from the slider to the belt. As far as chapes are concerned - these must have been very costly to produce in terms of time, so maybe chapes have not been found because they were so prized and expensive. In the same category of linen for Viking scabbards. I once made a scabbard for a Pompei style gladius project. I covered the wood part of the scabbard with a piece of heavy linen, since I did not have any leather on hand. I glued the linen to the wood using hide glue and did not bother sewing it up the back. I just folded the linen over and glued the seam. After the glue dried, I painted the linen with casein paint. I found it to be much more durable than leather and very hard. Combining the hide glue and casein paint made the linen very hard, almost a plastic feel. Right, you can't paint the waxed linen but nobody says you can't use coloured cloth. You just have to pick very light colours because the wax darkens them. A piece of linen dyed medium woad blue, for example, became almost black. Looking at that scan from Geibig's book (Abb.28,1), the scabbard tip, you could wrap the tip with two different colours of linen bands and then make the strips on the main scabbard body in alternating colours. You don't have to use plain natural linen. You can also embroider pictures into the linen. How archeologically correct embroidery is I don't know but it's something you can do. As for coloured cloth I'm pretty sure that was done even if I have not a shred of archeological evidence to back that up. Compared to the massive amount of literature there is on swords there is next to nothing written about scabbards. Apart from Geibig's book (in German) there is an article by Jan Petersen (in Danish) and a book called "Kuml og Haugfé úr heiðnum sið á Island" (in Icelandic) by a guy called Kristján Eldjárn who is kind of the grand poobah of Icelandic archeology. I also found a PDF describing the Cronk Moar scabbards. That's the only bit of data I have in English, I take it you only speak English? Also, if anybody knows any other sources on scabbards of this period I'd be interested. I'm not saying that Icelandic scabbards didn't have leather coverings, I'm just saying that a large proportion of 8-12th century scabbards were covered either only by waxed linen or a combination of waxed linen and a tip wrapped with a leather strip or fitted with a leather chape. Metal fittings were strictly limited to D or O rings that were occasionally fixed to the scabbard with a metal band though much more commonly with a leather band and of course there were sometimes belt buckles, all these fittings being usually made of iron. An example of a leather covered scabbard from Iceland is the scabbard from grave No. 4 at Sílastaðir. This scabbard was reasonably in tact. 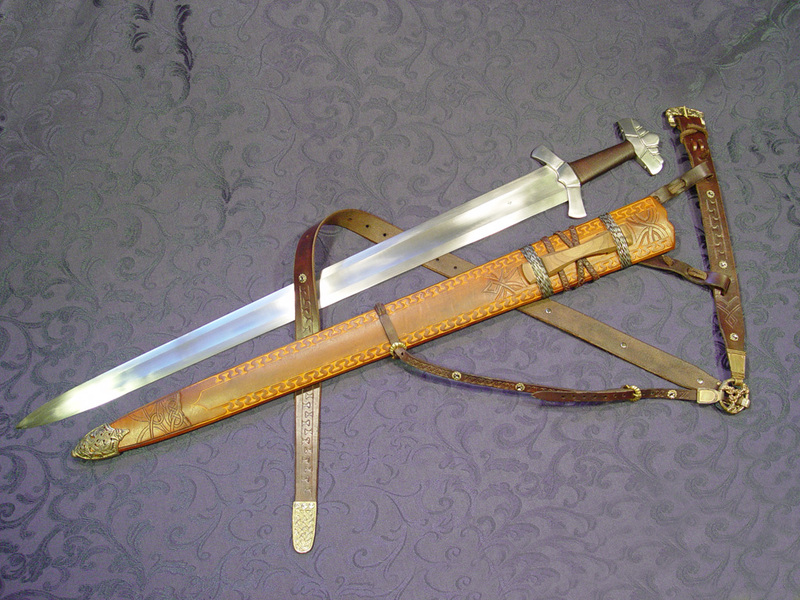 I'm planning to reproduce this scabbard for a replica of this sword that I've commissioned from Paul Binns. It was lined on the inside with linen which was presumably glued in. On the outside it was lined with linen. Whether it was waxed or glued is your guess. Im going with wax for waterproofing. I've done some experiments and waxing and found that it gives you real waterproofing. From what I have heard hide glue on the other hand is vulnerable to moisture and gets sticky when it is wet. On top of the cuter linen layer there was leather. You can grease up leather and make it mostly waterproof but if I was wanting to keep out rain my money would be on waxed linen, it does a better job. There was a small leather chape at the bottom of the scabbard. How it was attached is anybody's guess, it was probably glued on and possibly nailed in place. The scabbard had bands on it at a 90 degree angle to the length of the blade and at regular intervals. I can't offer any details other than that they seem to have been leather bands about 1-1,5 cm wide. Finally, about 12 cm below the scabbard mouth was an iron band the encircled the scabbard and seems to have been joined together by a single rivet. It was part of the scabbard fitting and is too badly corroded to judge how the scabbard was suspended. I'm going with two D shaped hoops on either side of the scabbard and a baldric. PM me your e-mail and I'll send you some high resolution pictures of this sword which is located in the National Museum in Reykjavik. I can probably also help you with pictures of the chapes. There is not a single surviving example of a slider from Iceland or as for as I know Norway as well. Icelandic swords and sword fittings seem to have oriented themselves mostly by what was happening in Norway/Denmark/Sweden and they in turn were heavily influenced by the Western Empire and to a lesser extent Russia and Byzantium. A few swords have been found in Iceland that are probably English but mostly the influence is Norwegian and Swedish/Rus. The best place to look for clues on Viking weapons fittings such as scabbards, belts, and armour is probably military fashions of Western Empire under the Ottonian and Salian emperors and to a much lesser extent England/Ireland/Scotland when discussing the Norwegians, Icelanders and Danes. The Danes probably absorbed the most influence from England but were heavily influenced by the Germans with whom they eventually allied themselves against the Slavs. The Swedes, however, were probably also significantly influenced by Russian/Slavic and Byzantines fashions. For the Icelanders Scotland/Ireland was probably a bigger influence than England since the Icelanders had a lot of contact with the Scots, some of Icelandic settlers came from Scotland and many of Icelanders had kin there. I do not speak Icelandic but I have Icelandic friends who can translate for me. Been to Iceland numerous times, hiked to the top of Mt. Esja in winter, even spent a couple of weeks driving around Myvatn and the Sprengisandur. I found some references to Icelandic chapes. Armour & Castings makes a nice reproduction of a chape that looks almost identical to one of the Icelandic chapes. For my Icelandic scabbard, I was going to make a slider from an Icelandic ram's horn. The scabbard is going to have a birch wood core, given that birch forests were plentiful in Iceland at the time of settlement. Simple leather cover without tooling. Armour & Castings chape. I am planning to cast my own baldric buckle. I appreciate as much data as you can provide. If we're to go with clothing fashion, then embroidery is probably out for Scandinavia, at least until the 12th century. Question from someone who's got little experience with wax: do you glue the linen first or just soak it in molten wax and then apply it? As for embroidery I'll have to do some research. About the waxed linen, I quite honestly have never tried to glue and wax. Many of these scabbards seem to have had a wooden core where the halves were not glued together like shown in that scan from Giebig's book. My current take on that is that the halves were simply held together by sewing the linen and/or leather tightly around the wooden core, Those (presumably) leather bands and (leather chord or string) cross-ties you sometimes see on these scabbards in illustrations (see image above) may have also served to hold the halves of the core together. I reserve the right to be wrong about that last point though. I think the reason for this would have been to allow you to disassemble the scabbard for refurbishment and repairs. We have synthetic glues today that dry into a solid substance that is either waterproof or highly water resistant. I don't have much experience with medieval glues but from what I have read they were much more sensitive to water than modern ones so I have my doubts about linen being glued to the outside of the scabbard for waterproofing. I think you'd get much better waterproofing by oilng the wood covering it in waxed linen and then, if you have a leatherfetish, putting a layer of leather impregnated with a blend of wax and oil on top of the waxed linen. I also suspect that you get better waterproofing from oiled wood + waxed linen than you get with impregnated leather. I recommend reading Tim Jorgensen's thread, it's what got me started on this quest. "Sliders were common in Britain during the time period that you mentioned, so why not Iceland? " We don't know that they were common, merely that that they were definitely used and that, based on the surviving leather covers from York, Gloucester and Dublin (supplemented by manuscript illustrations), the sliders were mounted underneath the leather cover. There's certainly no evidence to demonstrate that they were being mounted on the outside of the scabbard from the 8th century onwards. We know that suspension methods which do not use sliders were in use at the same time as sliders were being used, both before the period in question and during it. 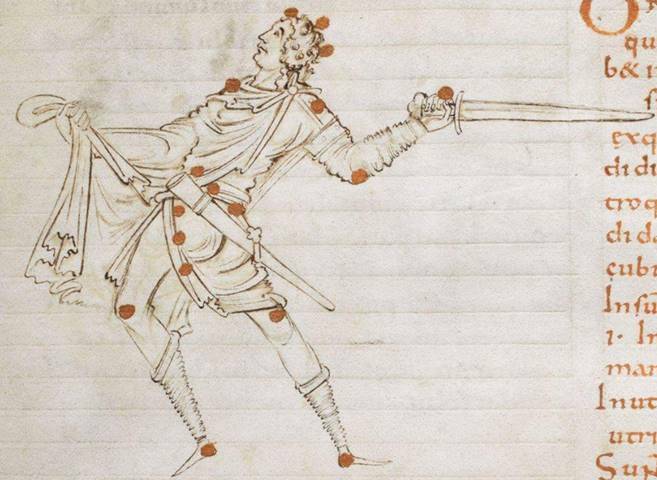 They were never the only suspension solution for scabbards in the early medieval period. I've got an English style sword that I'm planning to bescabbard once I'm done with my X type but I haven't really done any research yet on British styles of sword fittings except the Cronk Moar examples. Pray tell, where can I find pictures of these covers? What kind of sliders did they have, wood? ... bone? ... metal? I've got a few other resources. These are more about the Baltic areas. One in Russian, if you care, I can try to find it. I'm not doing the math of chape finds vs sword finds to hypothesize how common they were in these Eastern areas. But it's clear they were used, perhaps one could say while not common, they were not rare. Can we make solid suppositions based only what we have found, regarding widespread use? Likewise I won't hypothesize whether chapes were solely a "high class" feature. Anyhow, I really like your linen/waxy-linen covered scabbard idea and I hope you keep showing more of your research. Thanks. I'm not doing the math of chape finds vs sword finds to hypothesize how common they were in these areas. But it's clear they were used, perhaps one could say while not common, they were not rare. Can we make solid suppositions based only what we have found, regarding widespread use? Likewise I won't hypothesize whether chapes were solely a "high class" feature. I have a book that collected some statistics on Norway, they had no more than 10 chapes (this was in 2000) but over 2000 swords found in Norway so metal chapes were anything but common. If metal chapes were extremely common you'd expect them to show up in graves all over the place. Leather chapes or wrapped fabric 'chapes' (if one can call them that) are a different story. P.S. Thanks for that link, very interesting. What kind of sliders did they have, wood? ... bone? ... metal? The assumption is organic, wood, bone, horn (there are no finds post-8th century in Western Europe that I know of...somebody showed me what they claimed was an iron one once but on what basis it was being identified as such I don't know..it certainly didn't convince me). All that survives is the leather covering with the paired slits in for the strap to pass through and, in a couple of examples (most notably the one from Gloucester - I've attached some of the photos I took at Gloucester museum photos), the legacy mark of the slide itself survives imprinted on the inside of the leather. The assumption is organic, wood, bone, horn. All that survives is the leather covering with the paired slits in for the strap to pass through and, in a couple of examples (most notably the one from Gloucester - I've attached some of the photos I took at Gloucester museum photos), the legacy mark of the slide itself survives imprinted on the inside of the leather. Awesome! and thank for the amazon links. Looks like I'll be spending some money. About the scabbard covers, were they found alone or were they found complete with wooden core? If they weren't it's entirely possible somebody scavenged the sliders for scrap mental. That imprint in the leather looks like whatever was under it was made of metal. 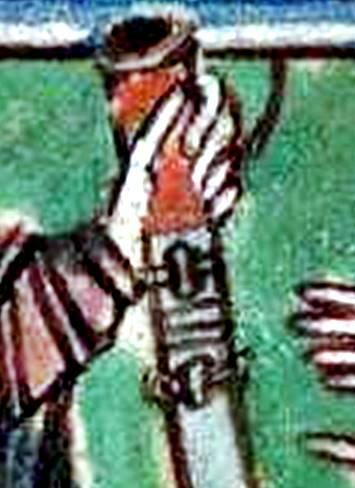 I've spent a lot of time looking through early medieval manuscripts at depictions of scabbards and there are some interesting examples. This one is particularly interesting (see attached). It's mid/late 10th century and it's from The Benedictional of St Æthelwold (Add MS 49598 in the British Library) , written by the scribe Godeman for St Æthelwold, Bishop of Winchester from 963-984. It seems to show a scabbard with two points of suspension (presumably slides mounted under the covering) and with the belt/baldric passing through both and being wrapped around the scabbard body between them. Again, no chape and the upper part above the suspension looks as though it may be wrapped with tape/braid as is the case with earlier English scabbards. About the scabbard covers, were they found alone or were they found complete with wooden core? If they weren't it's entirely possible somebody scavenged the sliders for scrap mental. That imprint in the leather looks like whatever was under it was made of metal. The leathers are found in rubbish dumps, having been stripped from the cores. I've reconstructed the Gloucester scabbard with a wooden slider and then stripped the cover from it after 4 years and the imprint is exactly the same as that depicted. I don't think you can tell anything about the material from the imprint. Why would you make it from valuable metal and then cover it with leather? They may have carved them directly into the front face of the scabbard. That's a method known from both English and Continental scabbards from the 5th to the 7th century. I just figured the imprints in the cover you posted photos of looked a bit too dainty to be made by a wooden slider that can stand up to some amont of abuse and the way the 'tails' at each end flared out into fans is typical for an iron object. You get this shape if you take an iron round bar, loop it into a '_/\_' shape and pound the tails of the '_/\_' progressively flatter towards the ends. If you are spending 500 grams or more of silver on a sword you'd be able to afford a metal slider. Iron in particular was not that precious.